With heads never hidden (sea turtles cannot retract their heads or limbs under their shells as land turtles can), sea turtles have glided proudly through more than 175 million years of existence. Tragically, the world’s eight species of sea turtles have all suffered serious declines in population just in the past 100 years. These majestic reptiles, remarkably adapted to life at sea, are affected directly and indirectly by human activities and deserve our concern and respect. 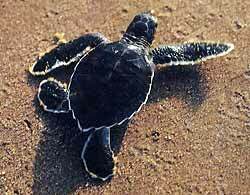 All sea turtles begin their lives as tiny hatchlings on a beach. They shuffle towards the ocean and venture out, their destinations still somewhat of a mystery to researchers. It is thought that baby turtles spend their earliest, most vulnerable years near large beds of Sargasso weed, which provide protection and nourishment for growth. They are then seen in near-shore feeding grounds when they are approximately the size of a dinner plate. They grow slowly and, depending on the species, they are between 15 and 50 years old when they reach reproductive maturity. 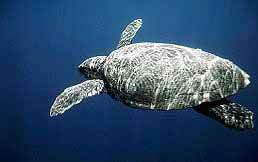 When it is time to nest, the female turtle will usually return to the beach where she was born to lay her eggs. 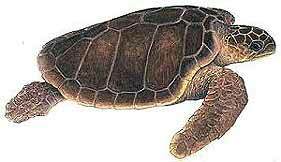 It is thought that some species live over 100 years, but there is no way to determine the age of a sea turtle from its physical appearance. 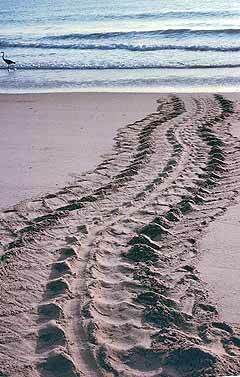 Loggerhead sea turtles (Caretta caretta) crawl onto the beach at Folly between May and September to lay eggs. Females nest between 2 and 5 times in one season and do not return for two to three years to repeat the nesting cycle. 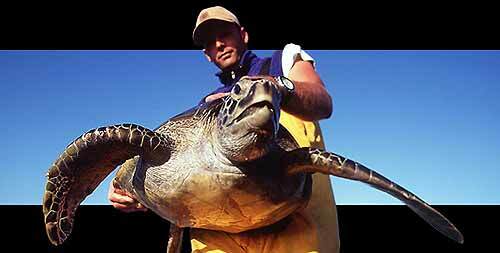 It is believed that they nest on the beach where they were hatched decades earlier. Therefore, the sustainability of nesting at Folly is dependent upon proper management of these nesting sights.